Wedges custom made have been used to improve the gait pattern of individuals with transfemoral (TF) Amputation. However, the prescription and test of these wedges is mostly based on a highly subjective gait evaluation. The purpose of this study was to develop a rational and quantitative method to prescribe wedges custom made for the sound limb of individuals with TF using Principal Component Analysis (PCA). First, the effect of different wedges was assessed in able-bodied subjects (CG). Second, using the influence of the wedges in CG, and the gait pattern of each TF individually, wedges were prescribed in order to modify their gait according to the specific effect of each wedge. The variables analyzed were the ground reaction force components and center of pressure displacement. The Mahalanobis distance for each variable and the 95% confidence interval (CI) based on CG data was calculated. Results showed, by the Mahalanobis distance of the variables, that TF subjects improved their gait pattern, TF subjects improved their gait; the variables that were out of the boundaries of 95% CI of CG, moved inside these boundaries with the use of wedges. The application of wedges to the sound limb of TF amputees can improve their gait patterns, thus the application of PCA can help clinicians to decide the best device for each patient, and consequently improve TF patient quality of life. Keywords: Gait, Ground Reaction Force, Center of Pressure, Amputees, CG data, Confidence interval. Individuals with transfemoral (TF) amputation show an asymmetrical gait pattern [1Nolan L, Wit A, Dudziñski K, Lees A, Lake M, Wychowañski M. Adjustments in gait symmetry with walking speed in trans-femoral and trans-tibial amputees. Gait Posture 2003; 17(2): 142-51. [http://dx.doi.org/10.1016/S0966-6362(02)00066-8] [PMID: 12633775] , 2Rabuffetti M, Recalcati M, Ferrarin M. Trans-femoral amputee gait: socket-pelvis constraints and compensation strategies. Prosthet Orthot Int 2005; 29(2): 183-92. [http://dx.doi.org/10.1080/03093640500217182] [PMID: 16281727] ]. Such asymmetries are mainly due to the absence of muscles and prosthetic device mass properties [1Nolan L, Wit A, Dudziñski K, Lees A, Lake M, Wychowañski M. Adjustments in gait symmetry with walking speed in trans-femoral and trans-tibial amputees. Gait Posture 2003; 17(2): 142-51. [http://dx.doi.org/10.1016/S0966-6362(02)00066-8] [PMID: 12633775] ]. As a consequence, the sound limb is overloaded [3Zmitrewicz RJ, Neptune RR, Walden JG, Rogers WE, Bosker GW. The effect of foot and ankle prosthetic components on braking and propulsive impulses during transtibial amputee gait. Arch Phys Med Rehabil 2006; 87(10): 1334-9. [http://dx.doi.org/10.1016/j.apmr.2006.06.013] [PMID: 17023242] ], and high rates of injuries, such as knee and hip osteoarthritis [4Melzer I, Yekutiel M, Sukenik S. Comparative study of osteoarthritis of the contralateral knee joint of male amputees who do and do not play volleyball. J Rheumatol 2001; 28(1): 169-72. [PMID: 11196520] , 5Struyf PA, van Heugten CM, Hitters MW, Smeets RJ. The prevalence of osteoarthritis of the intact hip and knee among traumatic leg amputees. Arch Phys Med Rehabil 2009; 90(3): 440-6. [http://dx.doi.org/10.1016/j.apmr.2008.08.220] [PMID: 19254609] ], and low bone density in the hip of the amputated limb [6Sherk VD, Bemben MG, Bemben DA. BMD and bone geometry in transtibial and transfemoral amputees. J Bone Miner Res 2008; 23(9): 1449-57. [http://dx.doi.org/10.1359/jbmr.080402] [PMID: 18410229] , 7Kulkarni J, Adams J, Thomas E, Silman A. Association between amputation, arthritis and osteopenia in British male war veterans with major lower limb amputations. Clin Rehabil 1998; 12(4): 348-53. [http://dx.doi.org/10.1191/026921598672393611] [PMID: 9744670] ] have been reported for prosthetic users. The role of therapists is to help individuals with TF amputation to reduce this asymmetry and to develop a gait pattern as close as possible to that of able-bodied subjects [8McNealy LL, Gard SA. Effect of prosthetic ankle units on the gait of persons with bilateral trans-femoral amputations. Prosthet Orthot Int 2008; 32(1): 111-26. [http://dx.doi.org/10.1080/02699200701847244] [PMID: 18330810] ]. Ground Reaction Force (GRF) and Center Of Pressure (COP) waveforms have been widely used to assess gait in different population of patients. Traditionally, discrete parameters are extracted from gait waveforms and a large number of variables are selected for analyzes. The complexity of analyzing many parameters might be overwhelming when a decision must be taken in clinical contexts. Principal Component Analysis (PCA) is a method to evaluate data that greatly reduces the number of variables to analyze [14Deluzio KJ, Wyss UP, Zee B, Costigan PA, Serbie C. Principal component models of knee kinematics and kinetics: Normal vs. pathological gait patterns. Hum Mov Sci 1997; 16(2-3): 201-17. [http://dx.doi.org/10.1016/S0167-9457(96)00051-6] ]. This approach applied to gait waveforms allows a better understanding of differences in gait patterns and deviations from normal walking. Also, it simplifies the evaluation of a clinical intervention because the number of parameters to analyze is smaller [15Chau T. A review of analytical techniques for gait data. Part 1: Fuzzy, statistical and fractal methods. Gait Posture 2001; 13(1): 49-66. [http://dx.doi.org/10.1016/S0966-6362(00)00094-1] [PMID: 11166554] ]. Even in this paper the application of PCA is related to gait deviations, the is a great variety in the possibilities of application. The aim of this study was to propose a quantitative method to prescribe wedges for individuals with TF amputation, based on PCA applied on GRF and COP gait waveforms. A Control Group (CG) composed of 20 physically active able-bodied subjects, 5 males and 15 females (mean age 67 ± 8.56 years old, mean weight 68.5 ± 6.2 kg), and an experimental group composed of 12 participants with TF amputation, 11 male and one female (mean age 56.7 ± 11.7 years old, mean weight 71.4 ± 11.7 kg) were enrolled in the present study Table 1. Both groups had a high score on the Physical Function domain of the QOL SF36 questionnaire [16Ware JE Jr, Gandek B. Overview of the sf-36 health survey and the international quality of life assessment (IQOLA) project. J Clin Epidemiol 1998; 51(11): 903-12. [http://dx.doi.org/10.1016/S0895-4356(98)00081-X] [PMID: 9817107] ] (82.3 ± 18.0 for CG and 62.8 ± 24.9 for TF), meaning that they felt few limitations to perform activities of the daily living envolving physical function. Participants’ features and prosthetic components. GRF and COP data were recorded using a piezoelectric force plate (Kistler Instruments AG, Winterthur, Switzerland) at 1000Hz, and a pressure plate (FootScan - RsScan, Olen, Belgium) at 300Hz, respectively. Both systems were synchronized using a separate unit equipped with a manual trigger to start simultaneously both systems. The protocol was divided into four phases. The aim of (i) Phase I was to evaluate the influence of wedges on the CG gait pattern. In (ii) Phase II, the gait pattern of the participants with TF amputation was assessed. The aim of (iii) Phase III was to use data from the previous phases to prescribe wedges for the sound limb of the participants with TF amputation. Finally, in (iv) Phase IV the prescribed wedges were experimentally tested. The protocol was approved by the ethical comitee of the rehabilitation center enrolled in the study. Phase I Protocol - test of different wedges in the CG: the able-bodied participants walked on a 8m walkway, where both pressure plate and force plate were embedded in the middle of the pathway – the pressure plate was over the force plate. After familiarization, each participant performed three gait trials walking at their self-selected speed and wearing their own shoes (with no wedge) – this was labelled as control condition (CON). Thereafter, they walked with four out of six wedges selected randomly. Three valid right lower limb trials were recorded for each of the four wedge conditions. The tested wedges were made of polyurethane material: two lateral, placed under the 5th metatarsal head having thicknesses of 1 cm (1L) and 2 cm (2L); two medial, placed under the foot arch having thicknesses of 1.1 cm (1M) and 2.2 cm (2M); and two posterior having thicknesses of 0.9 cm (1P) and 1.9 cm (2P), placed under the calcaneum bone. Therefore, a total of seven conditions were studied in CG: CON, 1L, 2L, 1M, 2M, 1P and 2P Fig. (1 ). Phase II Protocol – biomechanical gait assessment of the experimental group: the same protocol than Phase I was performed. Three valid trials were assessed. The participants with TF amputation were not tested with wedges in this phase. Phase III Protocol – wedge prescription: this phase is decribed in detail in section Wedge prescription. Phase IV Protocol – experimental assessment of the prescribed wedges: Three participants from the experimental group were tested with the wedges that the theoretical PCA model indicated as those that could make their gait pattern closer to the able-bodied participants’ gait pattern. They walked for about five minutes with each wedge for familiarization and the gait protocol from Phase I was repeated in which two valid trials were recorded for sound limb. Wedges conditions applied in the shoes. 1L: lateral one; 2L: lateral two; 1M: medial one; 2M: medial two; 1P: posterior one; 2P: posterior two. For the purpose of this study five waveforms were analyzed: vertical, medial-lateral, and anterior-posterior components of GRFs (GRFvt, GRFml, and GRFap, respectively), and the medial-lateral and anterior-posterior displacement of the COP (COPx and COPy, respectively). PCA was performed on the GRF and COP waveforms as previously described [14Deluzio KJ, Wyss UP, Zee B, Costigan PA, Serbie C. Principal component models of knee kinematics and kinetics: Normal vs. pathological gait patterns. Hum Mov Sci 1997; 16(2-3): 201-17. [http://dx.doi.org/10.1016/S0167-9457(96)00051-6] ]. In this study, 3 PCs were retained for further analysis [17Jolliffe I. Principal Component Analysis 1st ed. 1st ed.1986. [http://dx.doi.org/10.1007/978-1-4757-1904-8] ]. For the analysis of the influence of the wedges in CG (Phase I), the PCA model was developed based on the gait pattern of the subjects walking in CON condition (no wedges inserted). This model was then applied to the CG participants walking with the wedge conditions and principal component (PC) score values (obtained from the internal product of PC1, PC2 or PC3 to each waveform) for each subject in each condition were retained for analysis. A total of 15 PC score values were analyzed for each participant in each condition: three score values (PC1, PC2 and PC3 scores) for each of the five waveforms (GRFvt, GRFml, GRFap, COPx, and COPy) were calculated. For gait analysis of the prosthetic users (Phase II), the PC score values were obtained by the product of the PC model generated in CON condition, by the sound limb waveform data for each participant. PC score values for sound limb were retained for analysis in each of the five waveforms analysed. Sound limb PC scores were then compared to CON PC scores as described in section Wedge Prescription. To prescribe the wedges for each prosthetic user, some steps were followed. First, the influence of the wedges was verified in CG (Phase I), where one way ANOVA and post hockey LSD were used to compare the data collected (CON vs. the six wedge conditions) for the three PC score values from the five waveforms analyzed. The level of significance was set at α=0.05. After that, the Mahalanobis distance (T2) for CON PC scores and sound limb PC scores were calculated. This measurement uses the 3 PC score values obtained for each of the 5 waveforms (reducing from 15 scores to 5 T2 values), creating 5 new indexes, that allows to evaluate with one number that represents the whole waveform, the discrepancies from the analized data (sound limb) in relation to the normal pattern (CON). The CON data was used to calculate the 95% confidence interval, where the normal gait is defined. Then, each SL T2 measurement was compared to this interval to evaluate how far each prosthetic user was from the CON dataset. This parameter represents the distance between each sound limb PC score, (oi) and the mean of the PC score values for CON , normalized by the variance of each PC [18Muniz AM, Nadal J. Application of principal component analysis in vertical ground reaction force to discriminate normal and abnormal gait. Gait Posture 2009; 29(1): 31-5. [http://dx.doi.org/10.1016/j.gaitpost.2008.05.015] [PMID: 18640040] ]. where S-1 is the inverse of the covariance matrix of X and is the transpose of the vector . When a prosthetic user fell outside the CI range, the PC score values were then individually analyzed to determine which wedge could positively influence his/her gait pattern. This determination employed the results obtained in Phase I. Considering Phase I results, three out of the five variables analyzed (GRFvt, GRFml, and COPx) were influenced by at least one of the six wedges Table 2. The GRFap and COPy did not present significant difference between any wedge condition to CON (p>0.05). GRFvt was the most sensitive variable to detect the wedges influence, being statistically significant affected by four of them, both lateral wedges (1L and 2L) were different from CON in PC2 (1L: p< 0.001; 2L: p=0.02) and PC3 (1L: p<0.001; 2L p<0.001) and 1M condition was different in PC2 (p=0.02) and PC3 (p=0.04) and 2M in PC3 (p<0.001). GRFml was different in PC1 in 1L (p=0.03), 1P (p=0.01) and 2P (p<0.001) conditions when compared to CON. COPx PC score values were statistically significant higher in PC1 in the conditions 1M (p=0.04), 2M (p=0.01) and 1P (p<0.001) and lower in PC2 for the condition 1L (p=0.01) compared to CON. Considering the prosthetic users’ sound limb (Phase II), all participants, with the exception of the participant 12, showed variables with a Mahalanobis distance out of the 95% confidence interval range Table 3. Participants 11 and 12 had “n.a.” in GRF variables because their data could not be analyzed. The variables most affected were COPy, with 8 and GRFvt with 7 of the 12 participants out of CON range. The wedge prescription was made based on the results obtained in Phase I and Phase II. As shown in Table 2, COPy and GRFap were not affected by the wedges, thus these variables are not further analyzed Table 4. The second column in Table 4 summarizes the variables out of the 95% confidence interval range presented in Table 3. Columns 3 to 5 present the wedges that theoretically could influence positively a determined variable, based on the results from CON group Table 2. If a wedge affects the gait patter in an opposite direction or if the variable for a prosthetic user was not out of the 95% confidence interval range, it is shown as “n.w.”, to indicate that no wedge could positively influence the PC score. Phase I results-Wedges influencing Control Group: mean ± SD of the PC1, PC2 and PC3 scores from the vertical, medial-lateral and antero-posterior ground reaction forces (GRFvt, GRFml, GRFap) and Center of pressure displacement, (COPx and COPy) variables. Phase II results: T2for each prosthetic user. Phase III - Wedge prescription: Variables for each prosthetic user with T2out of Control condidion range (extracted from Table 3 - column 2); Individual PC scores for variables that could be influenced by wedges (columns 3 to 7); Wedges positively influencing PC scores in CON (see Phase I results – Table 2). 3.1. Application of the prescribed wedges: example of use. Three prosthetic users (participants 5, 7 and 9) were selected from the 12 analyzed to validate the suitability of the theoretical model for proposing wedges, in order to show an example of use in different cases. The first (participant 5) was selected because apparently no wedge could influence his gait; participant 7 was selected due to the differences in GRFml; and participant 9 was selected due to the differences in GRFvt and COPx which were not found in the other two cases Table 5. Phase IV results: Mahalanobis distance calculated before wearing the wedges (see Table 3) and with the wedges proposed for the sound limb. Participant 5 was already inside the CON range (Tables 3 and 5). Even though, the application of wedges approximated his values to the center of the CON 95% confidence interval. The wedges in GRFvt in CG Table 2 reduced the PC score values, and this behavior was confirmed in participant 5 Table 5. In GRFml and COPx the application of the proposed wedges kept the values inside the normal range. For participant 7, the wedges increased the PC score values but in 1L and 1P it was over the desired range. For participant 9, GRFvt PC score values increased with all the wedges, but only 1L and 2L were able to keep the Mahalanobis distance inside CON 95% confidence interval range. In COPx, the values increased towards the CON range. The purpose of this study was to prescribe wedges custom made for prosthetic users relying upon the influence that six different wedges had on the gait pattern of able-bodied individuals. The prescription of the wedges was based on the scores presented by each participant with TF amputation for the first three PCs of the biomechanical patterns analyzed (GRFvt, GRFml, GRFap, COPx and COPy). Not all prosthetic users could be helped with wedges. The gait pattern of some participants with TF amputation would not be positively influenced by the tested wedges Table 2. Eight out of the twelve prosthetic users could have wedges prescribed to alter their gait patterns towards that pattern observed in the able-bodied participants (CG). For GRF components in CG, the main effects of the wedges were on the vertical and medial-lateral components. GRFvt is the waveform most affected by the use of wedges Table 2. GRFvt PC2 is smaller for only 2 out of the 10 prosthetic users. Previous studies showed that the gait of individuals with TF amputation is characterized by an overload of their sound limb [19Nolan L, Lees A. The functional demands on the intact limb during walking for active trans-femoral and trans-tibial amputees. Prosthet Orthot Int 2000; 24(2): 117-25. [http://dx.doi.org/10.1080/03093640008726534] [PMID: 11061198] ] and thus there is high incidence of injuries [5Struyf PA, van Heugten CM, Hitters MW, Smeets RJ. The prevalence of osteoarthritis of the intact hip and knee among traumatic leg amputees. Arch Phys Med Rehabil 2009; 90(3): 440-6. [http://dx.doi.org/10.1016/j.apmr.2008.08.220] [PMID: 19254609] ]. The purpose of the intervention would be to reduce the scores to “unload” the sound limb and promote a more symmetrical gait pattern. As the effect of the wedges 1L, 2L and 1M was to increase GRFvt in PC2, it is likely to be detrimental to prosthetic users’ gait pattern. The smaller GRFvt PC3 score values presented in 5 out of the 9 prosthetic users Table 4 suggests an earlier heel loading of the sound limb to compensate for the lack of balance provided by their amputated limbs (Fig. 2a ) – GRFvt PC3 load vector). Analysis of wedges 1L, 2L, 1M, and 2M indicates that they increase this PC score value. This could imply the sound limb to contact the ground more slowly, as GRFvt PC3 is statistically significant from 8-12%; consequently, the amputated limb would have a longer single support phase. This finding should be evaluated by clinicians to determine if this would be beneficial to the patient. The influence of the wedge on this variable is further highlighted by the changes experienced by participant 5, who already had GRFvt inside normal boundaries Table 5. In the CG, differences in GRFml were observed in PC1 when the wedges 1L, 1P and 2P were used. These wedges reduced the PC scores Table 2. Only two out of the 10 prosthetic users showed smaller PC scores in GRFml (Participants 4 and 8 – Table 4. Higher PC scores indicates a more lateral migration of the medial-lateral force. The lack of knee active flexion on the amputated limb makes the forward motion more challenging, causing hip abduction and a laterally lift of the amputated limb to progress forward. This provides an explanation for the more lateral support provided by the sound limb. This could also be related to the overload reported in the medial knee compartment in individuals with TF amputation [20Hurwitz DE, Ryals AR, Block JA, Sharma L, Schnitzer TJ, Andriacchi TP. Knee pain and joint loading in subjects with osteoarthritis of the knee. J Orthop Res 2000; 18(4): 572-9. [http://dx.doi.org/10.1002/jor.1100180409] [PMID: 11052493] , 21Segal AD, Orendurff MS, Klute GK, et al. Kinematic and kinetic comparisons of transfemoral amputee gait using C-Leg and Mauch SNS prosthetic knees. J Rehabil Res Dev 2006; 43(7): 857-70. 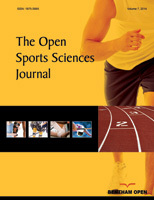 [http://dx.doi.org/10.1682/JRRD.2005.09.0147] [PMID: 17436172] ] and associated with the high incidence of knee osteoarthirts [4Melzer I, Yekutiel M, Sukenik S. Comparative study of osteoarthritis of the contralateral knee joint of male amputees who do and do not play volleyball. J Rheumatol 2001; 28(1): 169-72. [PMID: 11196520] , 5Struyf PA, van Heugten CM, Hitters MW, Smeets RJ. The prevalence of osteoarthritis of the intact hip and knee among traumatic leg amputees. Arch Phys Med Rehabil 2009; 90(3): 440-6. [http://dx.doi.org/10.1016/j.apmr.2008.08.220] [PMID: 19254609] ]. The wedges 1L, 1P and 2P decreased the PC scores shifting the force medially, possibly helping prosthetic users to protect have a better force distribution in their knees. An axample of the influence of the wedges obtained in Phase IV can be seen for participant 7, where the use of 2P wedge reduced the force peaks (Fig. 1b ). The medio-lateral displacement of the center of pressure (COPx) in CG was influenced by 1L, both medial wedges and 1P; where 1L tended to increase COPx PC2 while the others tended to decrease COPx PC1. Balmaseda et al. [22Balmaseda MT Jr, Koozekanani SH, Fatehi MT, Gordon C, Dreyfuss PH, Tanbonliong EC. Ground reaction forces, center of pressure, and duration of stance with and without an ankle-foot orthosis. Arch Phys Med Rehabil 1988; 69(12): 1009-12. [PMID: 3214258] ] found that the COPx trajectory is laterally deviated using an Ankle-Foot-Orthosis. Also, Guldemond et al. [23Guldemond NA, Leffers P, Sanders AP, Emmen H, Schaper NC, Walenkamp GH. Casting methods and plantar pressure: effects of custom-made foot orthoses on dynamic plantar pressure distribution. J Am Podiatr Med Assoc 2006; 96(1): 9-18. [http://dx.doi.org/10.7547/0960009] [PMID: 16415278] ] found a laterally deviated COP displacement using custom-made foot orthoses. Thus it seems the medial wedges and 1P promotes a more symmetrical gait pattern. Four out of five prosthetic users who didn’t present T2 values inside the 95% confidence interval, had PC2 scores smaller than those of CG Table 4. As the wedges 1M, 2M and 1P reduced these scores, they would not be useful for them. The other prosthetic users (participant 10) presented PC2 scores higher than CG. Erhardt et al. [10Erhart JC, Mündermann A, Mündermann L, Andriacchi TP. Predicting changes in knee adduction moment due to load-altering interventions from pressure distribution at the foot in healthy subjects. J Biomech 2008; 41(14): 2989-94. [http://dx.doi.org/10.1016/j.jbiomech.2008.07.021] [PMID: 18771767] ] showed that the COP position is a good predictor of GRF line of action, where a more medial position of COP leads to a greater external knee abduction moment. This would be harmful to the knee since higher abduction moment leads to a higher compression of the medial compartment. This is indicative of a more medially heel contact ((Fig. 2a ) – COPx PC2 load vector). 1L wedge tends to shift COPx laterally in this portion of the gait cycle, the use of the latter could be beneficial to improve balance at the beginning of stance phase (Fig. 2c ). The gait results using the wedges showed that they could influence positively the participants’ gait, as the Mahalanobis distance fell within the able-bodied participants’ range Table 5. Even in participant 5 who already had his parameters within the normal range Table 3, the Mahalanobis distance became closer to the central values of the confidence interval when wearing the wedges. For participant 7, in GRFml, the wedges proposed were 1L, 1P and 2P Table 3, all of them increased the Mahalanobis distance but two of them increased it over the normal range value, so 2P was the best wedge condition. For participant 9, the wedges proposed were 1L for GRFvt and COPx, and 2L, 1M and 2M for GFRvt only Table 4. The three wedges were able to increase the Mahalanobis distance, but only 2L showed results approaching the normal range. The analysis of the prosthetic users who were assessed using the wedges provided evidence for the validity of the theoretical biomechanical model, based on PCA in GRF and COP waveforms, for prescribing wedges for individuals with TF amputation Table 5. Even when the adaptation to the wedge is acute as in this work. More studies should be conducted to evaluate the long term effects of wedges on prosthetic users’ gait patterns. Furthermore, the effects of using more than one wedge remain to be elucidated as it could prove to be useful in order to improve more than one gait parameter at time. a) Load vectors from vertical ground reaction force (GRFvt PC2, GRFvt PC3), medial-lateral ground reaction force (GRFml PC1), medial-lateral center of pressure displacement (COPx PC1 and COPx PC2); the grey area highlights the 0.71 treshold of meaning proposed by Fig. 2 ; b) Prosthetic usuer before and after intervention for GRFml; c) Prosthetic user before and after intervention for COPx. The application of a theoretical biomechanical model based on PCA in GRF and COP waveforms for prescribing wedges to the sound limb of individuals with TF amputation was successful in improving their gait pattern. This could help these individuals to improve their independence and quality of life. Our results indicate that individual prescription of wedges is helpful to improve gait pattern. Our findings suggest that theorethical PCA models may be a useful tool for clinicians to prescribe wedges custom made to target patients who suffer from a variety of gait deficiencies. The local Ethical Committee approved all procedures according to the 1964 Helsinki declaration. No animals were used for this study. All humans research procedures performed in the current study were in accordance with the ethical standards of the institutional and/or national research committee and with the 1964 Helsinki declaration and its later amendments or comparable ethical standards. All participants gave their written consent to participate in the study.